#1 Compact Carrier, World Wide. Great gift for the Surfer in your life. 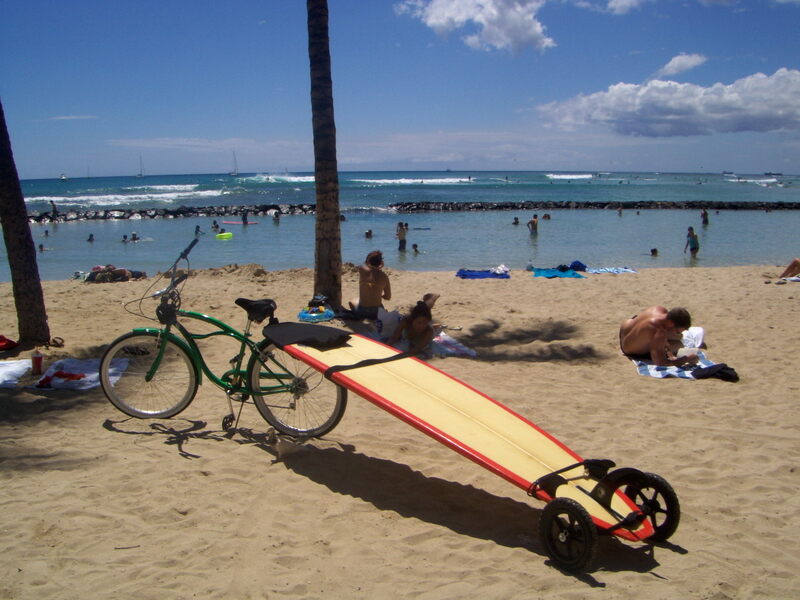 MULE TRANSPORT PRODUCTS have engineered a method, using cloth, which attaches wheels to any size surfboard and SUP. 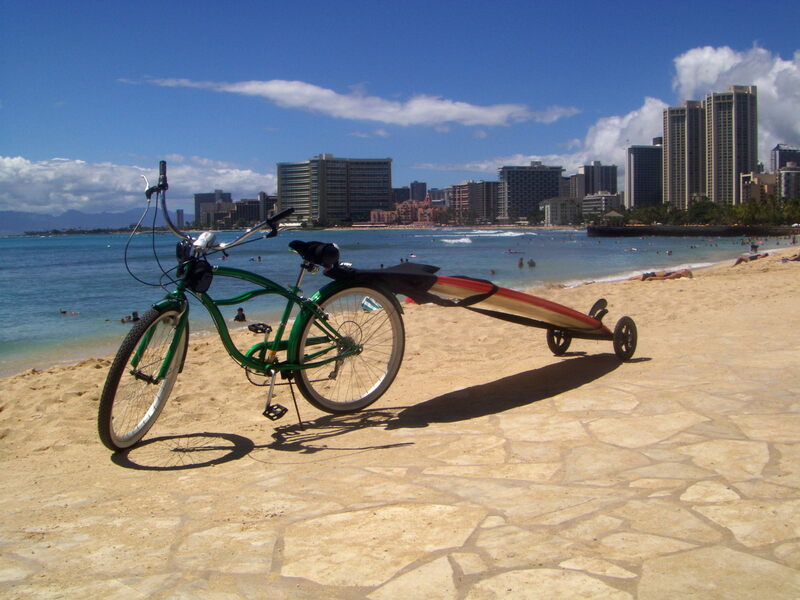 Your shortboard, longboard, and SUP, becomes a trailer which allows you to walk or pull it behind your bicycle. The STS MULE is a new and unique way to transport your board(s) and ALL your gear to the break or waters edge in one effortless trip. Two piece durable fabric. Universal tail piece fits all boards. STS nose piece has a handle strap and a pocket for wax, leash, and personal items. Tube tires with plastic mag wheels and quick release pins. Breaks down and sets up within seconds. Packs in a 12"x28"x3" travel bag(included) for easy storage. Goes with you ANYWHERE and EVERYWHERE. No perminantly attached bicycle rack. No hardware. No tools needed. NO MORE HASSLES!!! Hands free controlled ride with little or no wind resistance. Surfers will love the convienence of having the MULE in their car, airport travel bag, or home for the long walks with ALL YOUR GEAR. WORLD'S ONLY COMPACT SURFBOARD/SUP CARRIER/TRAILER!!!! Mule Transport Products, LLC. has received a United States of America Patent. #US 7,296,816 B2 All rights HIGHLY protected. The STS MULE is manufactured for Mule Transport Products by London Bridge Trading Company, the industry leader in tactical nylon gear. London Bridge Trading Company specailizes in gear for military forces, law enforcment, United States government agencies and other organizations around the world. There is NO framework! Your board becomes the frame. Trails behind your bike so a cross wind does not take you off your bike. No attachments to your bike so you can use your bike as you always have. IT JUST MAKES SENSE! The STS(Surfboard Transport System)MULE has an adjustible nose piece which fits short, long, and StandUp Paddleboards. Mounts in seconds with no tools or hardware. Slips onto any bicycle seat or walk with board in hand. Packs into its own travel bag. If you are interested in owning the most progressive company and product in the surf industry, contact James at muletransportproducts@cox.net for details.